In a ventilated patient, the relationship between the volume of the respiratory system and the distending pressure can be described easily. A large calibrated syringe can be used to change volume in small steps and the pressure in the airway is measured when the system is in equilibrium at the end of each inflation ( Beydon ef a/., 1991). Several pressure measurements are made as lung volume gradually changes. With stiff lungs, little volume change will occur compared with normal lungs at the same distending pressure. This is obvious when pressure and volume are displayed graphically, as the slope of the volume-pressure curve is steeper in the stiffer system. (cd Figure.., .1. 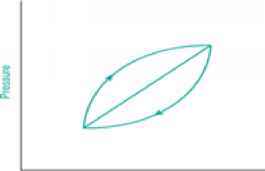 CD Figure 1. A stylized pressure-volume graph of the respiratory system. The slope of the line relates to the compliance of the system; when the slope is steeper a greater volume enters for the same pressure and compliance is higher. The combined compliance curve of the respiratory system is comprised of a chest wall component and a lung component ( Fig 1). In a healthy subject, the least pressure required to inflate the lung is found when the volume is in the mid-range. At total lung capacity (TLC), little change in volume occurs for unit change in pressure. Fig. 1 The pressure-volume curve of the lung, the chest wall, and the lung and chest wall combined. As the lung volume increases, more pressure is required because the lung reaches the limit of distension. When the recoil of the lung equals the outward force of the chest wall, the system is in balance and this is the resting position of the respiratory system (FRC). 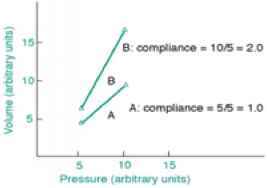 Compliance can be quantified as the slope of the volume-pressure curve (volume change per unit change in pressure). 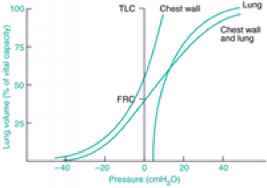 When measured from the FRC, the slope of both the lung and chest wall volume-pressure curves are equal and normal values are around 100 ml/cmH 2O. If the whole system is inflated, the pressure required would be doubled and the total compliance is 50 ml/cmH2O. The measurement of compliance is dependent on the lung volume from which the measurement is made. The term specific compliance allows for this by referencing it to lung volume. When lung volume is at or around FRC, the volume-pressure curve is linear and therefore compliance is constant. 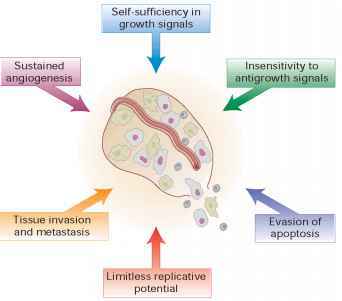 Changes in compliance can occur when the lung parenchyma is damaged; for example, destruction of the lung parenchyma (emphysema) reduces the 'springiness' of the lung, thus increasing compliance, whereas fibrosis has the opposite effect and reduces compliance. 'Static' compliance (Cst) is that measured when no flow occurs and the respiratory system is stationary. In the laboratory total static compliance is measured with the aid of a shutter and a mouthpiece. Pressure is measured at the mouth and the subject relaxes at lung volumes above and below FRC. If the subject is not experienced, the measured pressure can be affected by persistent ventilation or inadvertent contraction of the respiratory muscles. 'Dynamic' compliance (Cdyn) is that measured while the system is in motion, i.e. during respiration. In this circumstance the pressure between the airway and the pleural space is measured (transpulmonary pressure). Pleural pressure is transmitted to other mediastinal structures, such as the esophagus, and can be measured with a thin-walled air-filled balloon catheter passed transnasally. The pressure detected by the esophageal balloon is referenced to the pressure at the mouth using a differential pressure transducer and plotted simultaneously with lung volume ( Fig 2). Fig. 2 If the intrapleural pressure is plotted against volume simultaneously, a hysteresis loop is constructed. The degree of hysteresis is related to airways resistance. The gradient of the line drawn between the points of zero flow is the dynamic compliance of the respiratory system. With a constant distending pressure, the time taken for pressure equilibration will be related to the time constant of the system and the lungs will tend to fill exponentially. Dynamic compliance is measured between points of zero flow from the slope of the transpleural pressure-volume curve ( Fig 2). It should be noted that the hysteresis does not itself contribute to the slope of the curve. 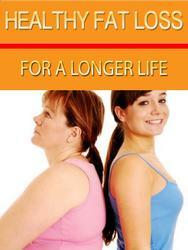 Rather, as the time taken for the lung to inflate increases, some parts of the lung may not fill adequately. Under these circumstances the dynamic compliance will be reduced. Compliance is most easily measured when the patient is fully ventilated, as the effect of continuing respiratory muscle activity is absent. The observation that muscle activity can either increase or decrease intrathoracic pressure underlines the artifacts that can occur during any spontaneous breathing. This is particularly relevant when measurements are automated (Sy,d,o,w...§L§( 1991).